This surreal location, called Mammoth Hot Springs which is located at the northern most part of Yellowstone National Park (near a little community of Mammoth). The springs are a series of 50 or so springs on a travertine hillside - that come to the surface at about 170°. It is a great place to visit when in Yellowstone, however, for the most park it is difficult to capture a great image to represent these unearthly views. The shot above is found off a boardwalk path on the southern section of the Upper Terrace. 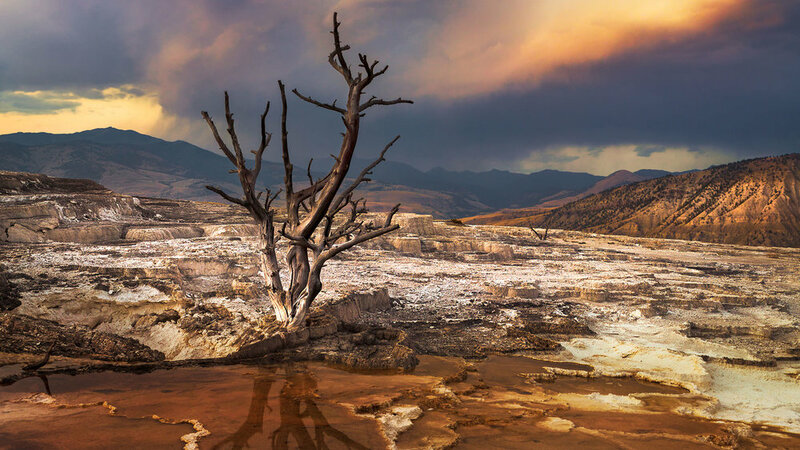 The dead trees in a travertine pool of steaming hot water can make for an appealing image, but needs the right light and water in the pools to make it work. I find this shot is best at sunset or dusk and really only works when the springs are running (which is not always the case). We provide exact GPS coordinates (in both DDM and DD formats) & elevation with automatic links directly into Google maps. Know beforehand what you are getting into! We provide a quick overview of the location. Is it easy, moderate or difficult to access? For each location we provide detailed directions along with a direct link to Google maps allowing turn by turn directions. It is all about the light! We help you plan your trip and let you know if the location is a sunrise, sunset or anytime shot. Sunrise might be best in summer or the water fall conditions are best for spring. We will let you know. If you are hiking a long distance, weight is important. We provide which lens(es) are needed to help lighten your load. Not every place is as you might think. We provide a personal insight to the location and an approach to taking the shot. For each location we provide a birds-eye view to provide a better understanding of the layout and terrain of the location. Integer placerat vitae lacus in pulvinar. Aenean fermentum sem sed purus suscipit auctor. Suspendisse laoreet fringilla. Unlimited access to all locations for as little as $2.99 a month. Guaranteed to add at least 1 new location each month. We respect your privacy and will NEVER share or sell your information!